The Paleo Recipe Book is a comprehensive guide to preparing meals according to the famous Paleo Diet and is written by the same author as the Paleo Restart, Sébastien Noël. There is plenty of information online about why the Paleo diet is so effective for health, energy and weight loss. However, many people find it challenging to know exactly what foods can be eaten with this diet. How to prepare healthy and delicious recipes is another challenge. The Paleo Recipe Book provides 372 recipes -more than one for every day of the year! It also comes with bonuses that provide you with additional insights for cooking the Paleo way. There are also recipes for people who don’t eat eggs, nightshades or nuts. There are thousands of health and diet books and programs online. When reviewing such products, I am always thorough in going through them and verifying that they live up to their claims. 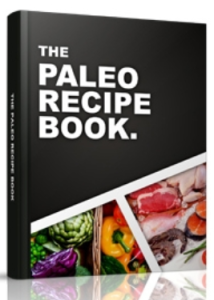 The Paleo Recipe Book, with its more than 400 pages of recipes plus bonuses, certainly looks impressive. However, let’s delve more deeply into it and see if this book can really help to change your way of eating and improve your health and quality of life! The Paleo Recipe Book was created for the purpose of providing people with one book they could use for easy reference whenever they need to find a Paleo-friendly recipe. For those not familiar with the Paleo Diet, it’s a way of eating that conforms to the way our distant ancestors ate -before the invention of processed foods, artificial additives and even modern agriculture. The recipes in this book do not include grains, sugar, legumes, vegetable oil or dairy. You avoid all of the heavily processed, unhealthy foods that are associated with obesity and many modern health problems. Many people are allergic or sensitive to dairy and/or wheat -the Paleo Diet takes all such foods off the menu. Fattening and starchy foods, including conventionally prepared bread, pasta and sweets are eliminated, making it easier to lose weight and maintain your ideal weight. While the Paleo Diet has some definite advantages, many people worry that they won’t have enough to eat. It can be challenging to think of avoiding modern convenience foods and giving up familiar food groups such as dairy, grains and legumes. When following what seems like a restrictive diet, there can also be the problem of boredom. Will you have to eat the same foods day after day? The Paleo Recipe Book provides a solution to this problem, with its hundreds of diverse recipes. Not only does this unique recipe book provide hundreds of Paleo recipes, it also comes with several bonuses, including a book on Paleo desserts, one on herbs and spices and one on simple Paleo meals. This book, in essence, solves the primary challenges facing people who want to go on the Paleo Diet -giving you a wide selection of meals that are easy to prepare, delicious and healthy. Red Meat -Recipes include Sheperd’s Pie, braised beef chuck roast, BBQ grilled lamb kebabs, fresh herb meatballs, steak & eggs and many others. Poultry -Almond chicken, mushroom & hazelnut chicken, coconut breaded chicken and wild mushroom roasted turkey and much more. Pork -Pork chops with apples & onion, garlic pulled pork, German pork hocks and pork-stuffed bell peppers and many others. Stir-Fried Dishes -Asian beef heart stir-fry, spicy shrimp stir-fry, cabbage & apple stir-fry, basil & chili beef stir-fry, etc. Seafood -Including baked garlic oysters, salmon fish cakes, bacon-wrapped scallops, white wine & garlic mussels and lemon & garlic scallops. Eggs -Omelet muffins, chicken liver omelet, zucchini quiche, smoked salmon omelet and avocado omelet. Organ Meats -Pork liver & heart pate, grilled liver with bacon & mushrooms, pig’s feet stew and roasted bone marrow and many others. Stews & Curries -Special pork stew, dark chocolate venison stew, beef goulash, bigos, chicken curry, Brazilian fish stew and much more. Soups -Pumpkin soup, homemade stock, shrimp gumbo, red beet soup, leek & sweet potato soup with saffron, gazpacho and much more. Salads -Basil & tomato salad, classic creamy coleslaw, kale & seaweed hot salad, tuna salad, classic egg salad and many others. Vegetables & Side Dishes – Including sauteed kale, creamed spinach, Brussels sprout and bacon medley, coconut-creamed leeks, ratatouille and much more. Snacks -Trail mix, pork rinds, deviled eggs with bacon bits, zucchini chips, roasted chestnuts, spicy pumpkin seeds and much more. Smoothies -Spicy tomato smoothie, pumpkin smoothie, kale & banana green smoothie, coconut vanilla milkshake, almond butter & chocolate blueberry smoothie, etc. The above is just a very small sampling of some of the recipes included in the Paleo Recipe Book. Having all of these recipes at your disposal gives you a huge selection of dishes to choose from, whether you are preparing breakfast, lunch, dinner or a snack. The bonus material provides you with even more choices for preparing healthy and tasty Paleo dishes. Paleo Meal Plan -Helps you plan your meals for the week, ensuring you get a variety of foods and a good nutritional balance. Herbs and Spices -Knowing which herbs and spices to cook with and when to use them goes a long way in making your food more interesting and nutritious. This book tells you which of these flavorful ingredients to use to make your Paleo dishes even better. Paleo Desserts -Desserts can be tricky with the Paleo Diet, but this book will ensure that you have an ample supply of tasty treats that you can enjoy while still staying true to your diet. Quick and Simple Paleo Meals -For when you don’t have much time but still want to prepare a great Paleo meal or snack. The bonus books are a convenient accompaniment to the main recipe book. Together, you will never have to wonder about what to shop for or cook under the Paleo Diet. I have identified several pros and cons regarding the Paleo Recipe Book. Easily one of, if not the most thorough and comprehensive guide to preparing paleo dishes on the market. Makes it easier to stick to the Paleo Diet by providing you with an ample selection of dishes to prepare. Provides alternatives for people who cannot eat certain foods, such as nuts, eggs or foods from the nightshade group. Includes useful instructions for cooking, such as measurement conversion tables and guidelines for preparing meats for rare, medium or well-done. No product is perfect for everybody. There are a few features of this one that some people might find limiting. Following the Paleo Diet does require some effort and focus. Even with all the recipes you get here, you will still have to make a conscious choice to make the transition from a mainstream diet to the Paleo way of eating. Not Very Vegetarian or Vegan-Friendly -Many of the recipes contain meat, fish or eggs. Strict vegetarians may find that the book does not give them many options. This, however, is a feature of the Paleo Diet in general. The book is in digital form. This can be considered a benefit in one way, as you can download it instantly. However, if you want a printed version you will have to print out all 400+ pages. The Paleo Recipe Book is an extremely useful resource for anyone who is on, or who wants to go on the Paleo Diet. There are quite a few advantages to the Paleo Diet that you cannot get from most other diets. Even many diets that are superficially similar, such as some popular low carb-high protein diets are not necessarily healthy, as they often recommend processed foods. The Paleo Diet, on the other hand, lets you avoid many staples of the modern diet, such as trans fats, processed foods, sugar and dairy. Such foods, which people have become accustomed to, may contribute to many diseases and can make it difficult to lose weight. Following the recipes in the Paleo Recipe Book will ensure that your diet is based on simple, nutritious and unprocessed foods. Compared to signing up for an expensive diet plan, using drugs or medical procedures to lose weight or trying a series of ineffective fad diets, the Paleo Recipe Book provides a powerful and economical solution. For a one-time cost of $39, even less if you get it on sale, you will have recipes and Paleo cooking guidelines to last you a lifetime. Furthermore, the book comes with an unconditional 60 day guarantee. You have a full two months to examine the book and ask for a full refund. There is no risk on your part, while you have the possibility of opening the door to a whole new and healthier way of eating. In conclusion, I would heartily recommend the Paleo Recipe Book to you if you are looking for a healthier and more natural way of eating. It’s also an excellent investment if you are already on the Paleo Diet but are having trouble finding good recipes.